The best way to do Effective Du’as is to send the reward of as a gift, a an offering as it were. By saying I send this read, of all that I’ve read to …. Its good recite Surah Ya-Sin (Surah 36) at the home or graveyard and the last two surah of Barakah. And send the reward to the dead souls of your relatives and teachers on Thursday night. Because it’s the night when the souls are released to go roaming and they go to see there families and students. They come to there sons and daughters houses, now do you want them to go empty handed back. Three things will the dead soul benefit when it passes from this world, because you’re your dead that’s it, your rewards stop. But the one who builds a school, a bridge, a well, or a plants a tree (or something that the living can use and benefit from) as long as they are being used by the living, the dead will benefit by taking rewards from those who benefit from using there life’s work even so they are dead, second Sadaqah given by the dead and thirdly a righteous son or daughter doing Dua for this father or mother. Also it says its good to send 10,000 salawat ala rasul (durood Shareef) upon the person as a guarantee protection. 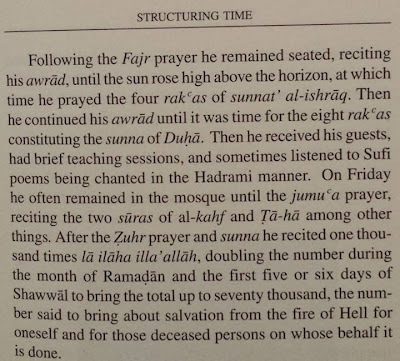 More about the salawat ala rasul (durood Shareef) stories really need to be added from the other book of Shaykh Ozak Muzaffer Jerrahi, Called Irshad-(Irshad is Spiritual guidance) were Shaykh Hassan basri the student of Sayyid Ali ibn Talib, was asked by an old women, about seeing the state of her daughter in the grave, the Shaykh gave her a dua, after she came back and crying and told the Shaykh about her dream seeing her in a terrorable state and punishment. They all prayer and weep for her, then later the Shaykh had a dream and saw a beauty a young women dress in Nur and crowned with heavenly beauty, don't you recognise me ya Imam no? he said which prophets wife or daughter are you? You taught a mother a so she could see her daughter, I'm her! But she said you're in great pain and punishment the grave! How is this your station now? A Wali-allah – True Friend of Allah passed by our grave and sent only 3 salawat ala rasul (durood Shareef) upon us 550 in the graveyard were forgiven. There are so many stories like this one, insh'allah I might put some of those stories up as links if people would like to read them, but I ready don't want add too many stories here, other wise I'll go off in a tangent. Send the reward of 70,000 la-e-laha ill-lal-lah to yourselves before you die, a very good way Insh’allah as a down payment and security from punishment in the grave. And don’t forget the insurance policy of 10,000 salawat ala rasul (durood Shareef) upon one self as a guarantee protection. The reason why I call the above a secret is not many people know of it, that is common people as well as learnt ones thus I’m calling it secrets or gems would be better, and not hidden secrets. Other ibadah that’s more commonly known to many people is to read Surah Mulk, every day and there is a tradition that every Muslim should memorise these 30 verses, as they will be a source of protection in the grave. When we embarks on any journey, you did to get with all the essential luggage to even the tooth paste, otherwise we will have problems once we arrive at out destination. But have we pack with us deaths suit case, what’s in there right now to when we leave, this dunya we can take? And you also need a ticket otherwise you cant get on board the plane to travel anywhere. Shahadah is the only official ticket valid until the day of judgement. salawat ala rasul (durood Shareef) gives you a first class ticket with all the perks. Otherwise your just given a cheap or economy class ticket. Yes were Muslims but the struggle is getting that shahadah and making it a on-way ticket to jannat with on pit stops to hell. 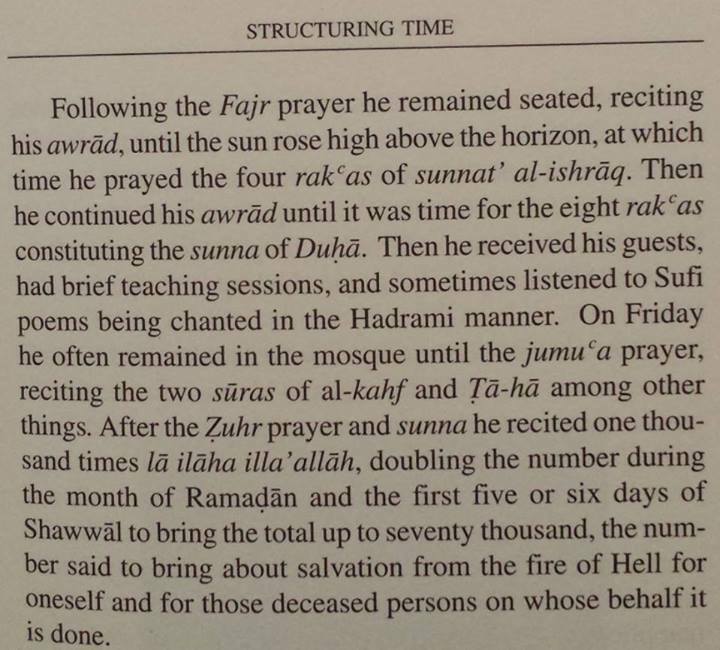 In ‘Sufi sage of Arabia’ by Imam Haddad from chapter 4 ‘structuring time’, it mentions that the Imam Haddad would reciting 1,000 la-el-aha-ill-lallah and doubling the number in the month of Ramadhan thus 2,000 and read into the first 5 days of Shawal so to total 70,000 la-e-laha-ill-lallah, the number which is said to bring salvation from the hell fire for oneself or on behalf of the decreased who it is done for. Ghawth Al-Adham Shaykh ‘Abdul Qadir Jilani says: Cultivate 4 practices and repeat them frequently as 2 will earn your Lords pleasure and 2 you just cannot afford to do without;1st Dhikr Tahleel of la-e-laha-ill-allah. (as for the others see link or comments) in Tariqah al Qadiri Budshishiyyah, The basic Tahleel of la-e-laha-ill-allah is 15,000 per day if you can manage this your just about Faqir of theTariqah, so in Ramadhan this plus the Group gathering at a basic level you reciting over half a Million or 500,000 Tahleel of la-e-laha-ill-allah. A very good link article, similar to the above, again by the great Qutb Imam Haddad book’s lives of Man. Section called How the Living can help the dead . More aspects with traditions mentioned. Must read. 1. 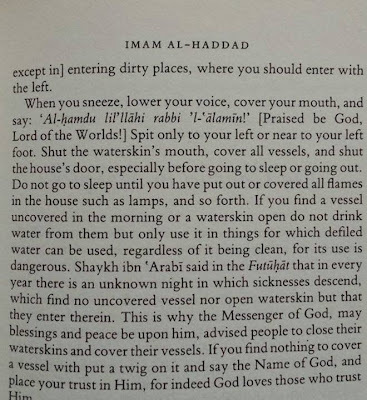 It is related in the hadith: "Whoever says La-e-lahaa ill-lal-lah=No gods except The-God-(Allah)" and lengthens his pronounciation intending thereby to magnify God, God will forgive for him Four thousand grave sins with it, and if he did not commit Four thousand, God will forgive the difference for his family and neighbors. It is related in the hadith: "Whoever says " No god except God" and lengthens his pronounciation intending thereby to magnify God, Four thousand of his sins are astruck thereby from the register of his sins." see article lengthens his pronounciation. Allah has caused this ayat to be effective as a cure for every sickness, an aid to every kind of healing treatment, a relief from every form of poverty, a shield against the Fire of Hell, and a guarantee of security from degradation, misrepresentation and slanderous accusation, as long as they [His believing servants] keep up the practice of reciting it. 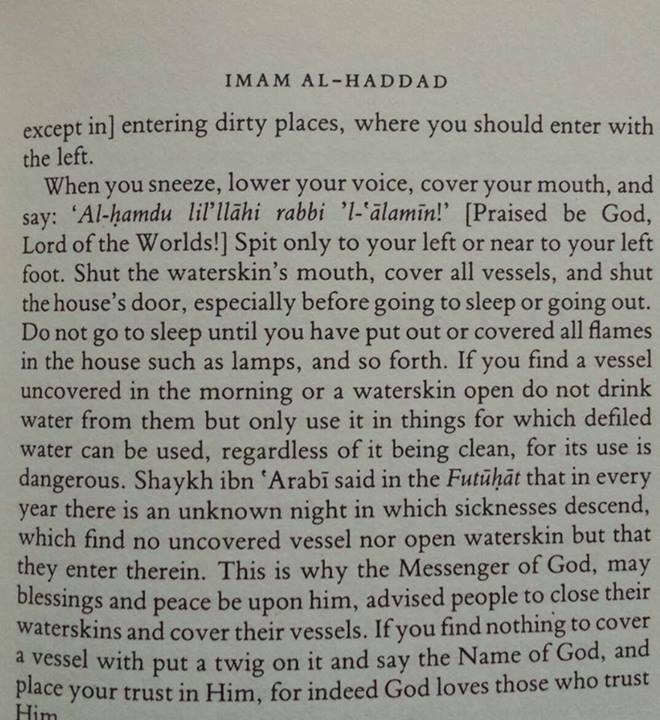 Your ‘awra – Nakedness is hidden from Jinns when you say bismillah when you undress or go to the toilet, otherwise they see you nakedness. 3. Reciting the Opening Chapter (Surah Al-fatiha) with In the Name of Allah, the Merciful, The Compassionate Bismillah-hir-rahman-nir-raheem in ONE breath without stopping.! ...... bear witness that I have forgiven him, accepted his good actions and overlooked his evil actions and I will not burn his tongue with the fire and I will protect him from the punishment of grave, the punishment of Fire, the punishment of the Rising and the Greatest Terror. He will meet me before all the Prophets and Saints. Aameen in one breath without stopping ..! The Messenger of Allah, Allah's blessings and peace be upon him, said, ‘For the one asks for blessings upon me there is a light on the Bridge, and whoever is on the Bridge from the People of Light will not be among the People of the Fire". And he said, Allah's blessings and peace be upon him:"Whoever deliberately neglects to ask for blessings upon me has missed the path to The Garden, for the route to The Garden is barred for such a neglectful one, whereas it is open for him who asks blessings upon me". Allah's blessings and peace be upon him:"Gabriel, peace be upon be him said,' O Muhammad, whenever someone from your nation asks for blessings upon you, seventy thousands angels bless him, and whoever is blessed by angels is one of the People of The Garden". And he said, Allah's blessings and peace be upon him: "The more you ask for the blessings upon me, the more you will have in The Garden" Allah's blessings and peace be upon him: "Whenever someone asks for blessings upon me, extolling my right, Allah, Mighty and Sublime is He, creates from his words an angel with wings stretching from the East to the West, with feet connected to the nethermost part of the seventh earth and a neck bent beneath The Throne. Allah, Mighty and Sublime is He, Says to him, ‘Bless My slave as he asks for blessings upon My Prophet and thereupon the angel will bless him until the Day of Resurrection". Allah's blessings and peace be upon him:"There will come to my Pool on the Day of Resurrection nations I will only know because of their frequent asking for blessings upon me". Allah's blessings and peace be upon him:"Whoever asks Allah to bless me, Allah will bless him ten times, and whoever asks ten times to bless me, Allah will bless him one hundred times, and whoever asks Allah one hundred times to bless me, Allah will bless him one thousand times, and whoever asks Allah to bless me one thousand times, Allah will prohibit The Fire from touching his body, his word on any matter will be made enduring in this world and the next, he will enter The Garden, on the Day of Resurrection his request for blessings upon me will be a light for him on The Bridge, a light visible at a distance of five hundred years, and Allah will grant him for every blessing upon me asked for a palace in The Garden, regardless of how many".